Traveling with kids can be tough. It can be even more of a headache when you’re traveling with the entire family during the holiday season. Millions of Americans jump on a flight or hit the road during the holidays to reconnect with family and friends. It is after all the most wonderful time of the year, right? Well, with so many people on the road and in the air during this magical time it can quickly become a nightmare. You have to be prepared for the crazy weather, delayed departures, and terrible traffic. And when you’re traveling with baby, that can make it even more difficult on you. But with a few tricks it doesn’t have to be. We’re sharing 8 holiday family travel tips to help you keep your sanity and help keep the kids happy while traveling to your destination. Many parents feel like they have to pack everything and the kitchen sink with them when traveling with their kids. While a lot of the items are nice to have, you really only need the essentials: a stroller, baby carrier, formula or breast milk, snacks, clothes, diapers, wipes, toys, and maybe a travel crib. Make it easier on yourself and pack only what you and baby need. You will be grateful when you’re not lugging everything in the car or through the airport with you. When looking at all of the travel essential products, I found the perfect travel stroller for every family. It’s the nano stroller from Mountain Buggy. 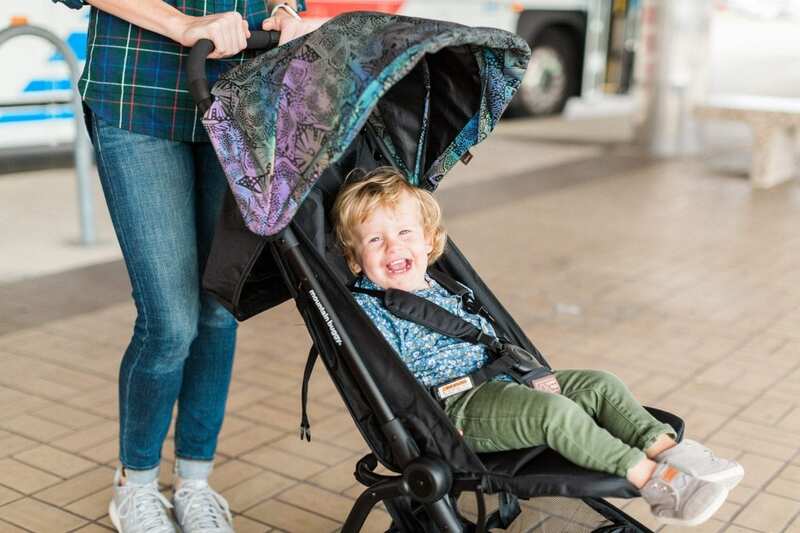 This travel stroller is lightweight (less than 13lbs), compact (measuring just 21 x 12 x 20″ when folded), and super convenient to use while you’re out and about. It can easily fit into many carry on luggage units for planes, trains and automobiles. I love testing it out so much that we selected it as our Product of the Month for November! It was super simple to put together as well as fold and unfold. With the press of 2 buttons, the nano stroller drops in 2 stages, leaving it the size of a compact travel satchel. It comes with a custom-fit, compact travel bag and you can either expose the handle or attach the shoulder strap for an easy and light carry on. It’s the perfect item to have to make traveling so much easier (and stylish 😉 ) for you and baby. And I’m obsessed with their newest design “silhouettes.” Following on from their popular special edition prints celebrating the Chinese Zodiac, Mountain Buggy just now introduced their third special edition print, ‘silhouettes’ design — a 2018 celebration for the Year of the Dog — the eleventh of 12 animals in the Chinese Zodiac. The worst days to travel during the holidays are the Wednesday before Thanksgiving (this year, Nov. 22) and the following Sunday (this year, Nov. 26). For Christmas they’re Friday, Dec. 22, plus the 23rd and 24th. For New Year’s this year avoid Friday, the 29th, and Tuesday, Jan. 2. Stay away from the airports on these days. If you must travel, give yourself plenty of time to check in and board. Which brings me to my next point . . .
We all know that our babies require us to leave earlier than normal when it comes to going anywhere. When you are traveling–especially during the holidays–give yourself even more time than usual. If you normally get to the airport an hour early, I recommend getting there two and a half hours early or maybe even three. You need to take into consideration bad traffic, finding a parking space, long TSA lines, baby having a meltdown or a blowout, etc. If you’re doing a road trip, there will probably be extra cars on the road and some bad traffic. Leave plenty of time as well as for feeding breaks and diaper changes throughout your trip. If you’re traveling across the country or abroad, we recommend taking the red eye so your little one can sleep on the flight or bus. With the nano stroller you can also recline the stoller to let your little one continue to rest. You can also fold down the sunshade for a little extra coverage. Most of us only think of traveling by plane or taking a road trip to our final destination, but babies also love traveling by train, bus and boat. It gives them a new experience and allows them to see the world in a new, fun and different way. I don’t know about you, but when I travel I feel the most comfortable when I am dressed casually. Sweats and yoga pants are my jam. And when you’re traveling with your little one wearing something that is easy and comfy is the best thing. Same thing goes for your baby. And since planes can get warm on the ground and cold in the air, make sure that you bring a jacket or blanket for them to stay comfortable. Layers are your friend. Have in your carry-on some travel food that is age appropriate for your child. It’s rare for children to like the plane food so snacks are your saving grace to avoid tantrums. Food usually helps any situation. Babies can get bored very easily so plan fun activities to keep them entertained while traveling and once you have arrived at your destination. No one wants to have that kid who is screaming in the airport or on the plane. With the nano stroller you can easily wheel your child around the airport as you wait for your flight. Give them a little tour, bring some of their favorite toys or a stuffed animal to keep them calm, and if all else fails pull up a video on your smart phone or iPad. Tha’ll usually help. Once you arrive at your location, have some fun plans for your babe. Put them in your stroller and show them around town. With the nano stroller, they will have a smooth ride since it has built-in rear wheel suspension to keep your baby comfortable on their travel adventure. There is also an easy to use color defined brake for extra safety and 5.5” EVA wheels for a smooth ride. The front wheels feature swivel and lock capabilities for awesome handling in tight spaces and uneven surfaces. These innovative features plus cleverly designed weight distribution make nano a breeze to push and easy to pop up over curbs. We believe that you should not only enjoy your destination, but you should enjoy the journey along the way. With the nano stroller and these tips you should have happy travels and a great holiday season.